Remember, you can always get access to the Seattle Bubble spreadsheets by supporting my ongoing work as a member of Seattle Bubble. It’s pretty much the same story we’ve seen the past few months, which is good news for buyers: The number of home sales is falling and the number of homes on the market is climbing quite a bit. Foreclosures are still very rare. First up, let’s look at our inventory charts, updated with previous month’s inventory data from the NWMLS. The number of homes on the market in King County dropped 29 percent from November to December. Year-over-year listings are still soaring, up 143 percent from December 2017, another new all-time high year-over-year gain, passing the record of 114 percent that was set just a month earlier. 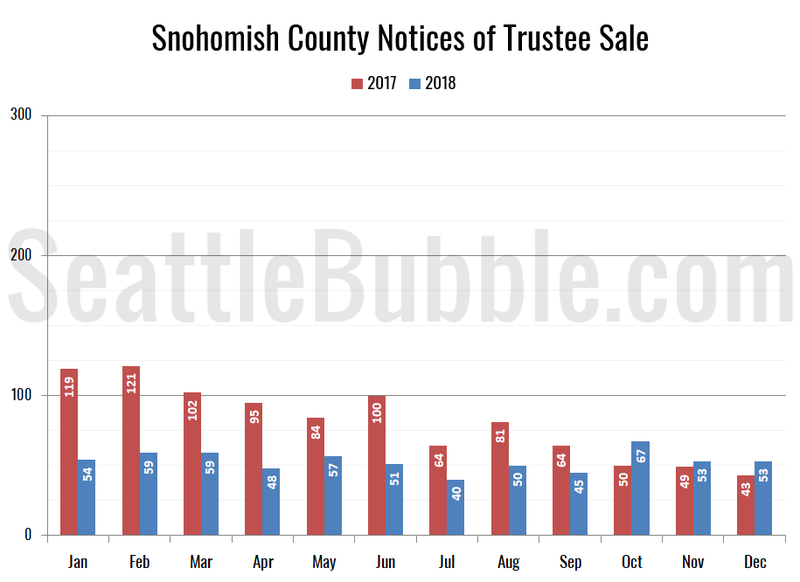 In Snohomish County inventory fell month-over-month 25 percent, and the year-over-year growth also hit a new all-time record, growing 111 percent. Note that the Estately inventory data feed seems to be having some trouble, so these preliminary numbers may be off by more than usual. I’m looking into that. Sales in King County fell 5 percent between November and December (a year ago they fell 4 percent over the same period), and were down 22 percent year-over-year. 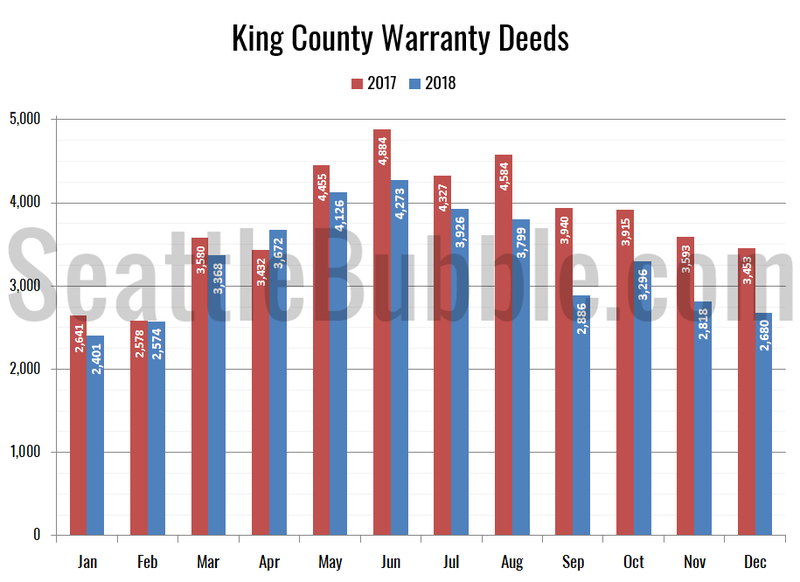 Here’s a look at Snohomish County Deeds, but keep in mind that Snohomish County files Warranty Deeds (regular sales) and Trustee Deeds (bank foreclosure repossessions) together under the category of “Deeds (except QCDS),” so this chart is not as good a measure of plain vanilla sales as the Warranty Deed only data we have in King County. 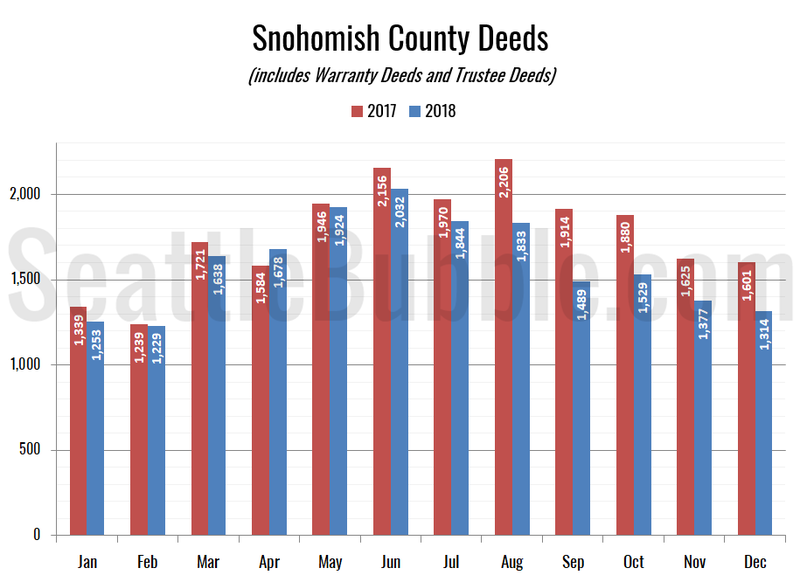 Deeds in Snohomish fell 5 percent month-over-month (versus a 1 percent decline in the same period last year) and were down 18 percent from a year earlier. Hit the jump for the foreclosure charts. 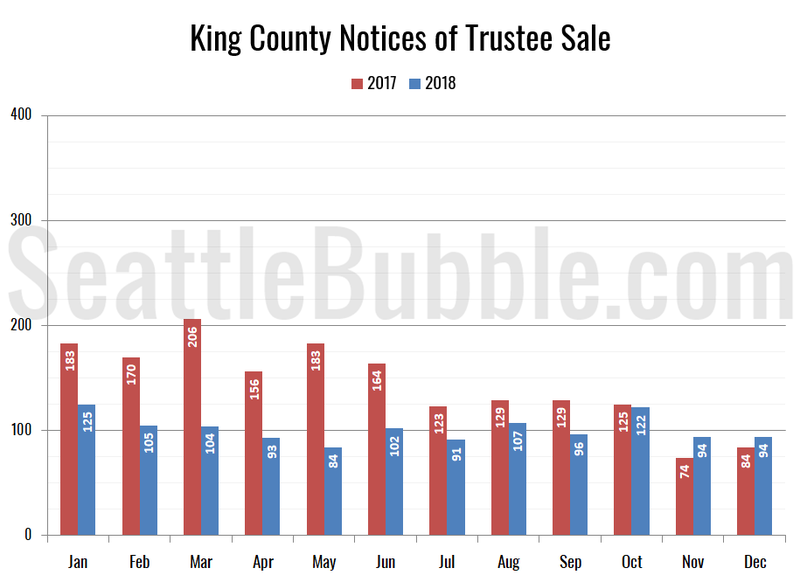 Foreclosure notices in King County were up 12 percent from a year ago and Snohomish County foreclosure notices were up 23 percent from last year. Since the numbers are so low, these increases appear large in percentage terms, but the increase represents just 10 additional foreclosures in each county compared to the prior year. 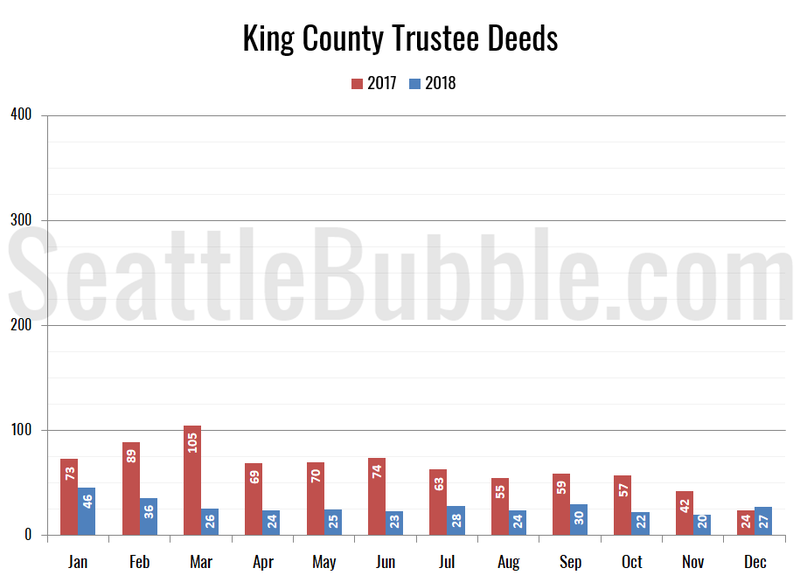 Trustee Deeds were up 13 percent from a year ago. 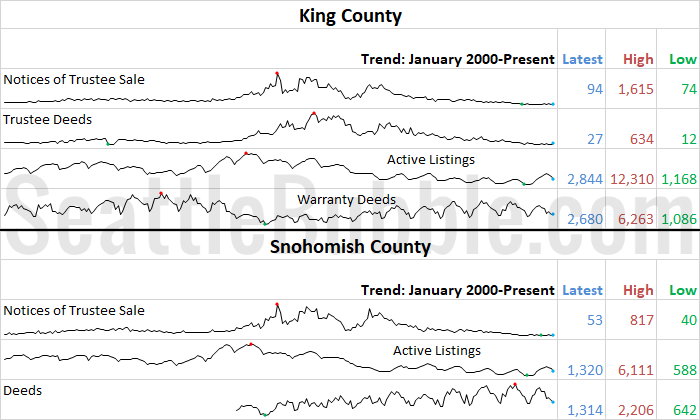 Note that most of the charts above are based on broad county-wide data that is available through a simple search of King County and Snohomish County public records. If you have additional stats you’d like to see in the preview, drop a line in the comments and I’ll see what I can do. Stay tuned later this month a for more detailed look at each of these metrics as the “official” data is released from various sources. new listings in spring will be massive it feels like.. Cue the folks saying this is a return to normal. It’s like when you get drunk, go on a high-speed chase, and crash your car into a schoolbus. You can just say, officers, I understand things got a little out of hand, and I am back to normal now that I am sober, so I’ll just be leaving now. RE: steven @ 1 – You are probably right. Dec ’17 KC listings is 1,168. All months of 2018 have higher numbers, as high as 4.5x the Dec ’17 number. 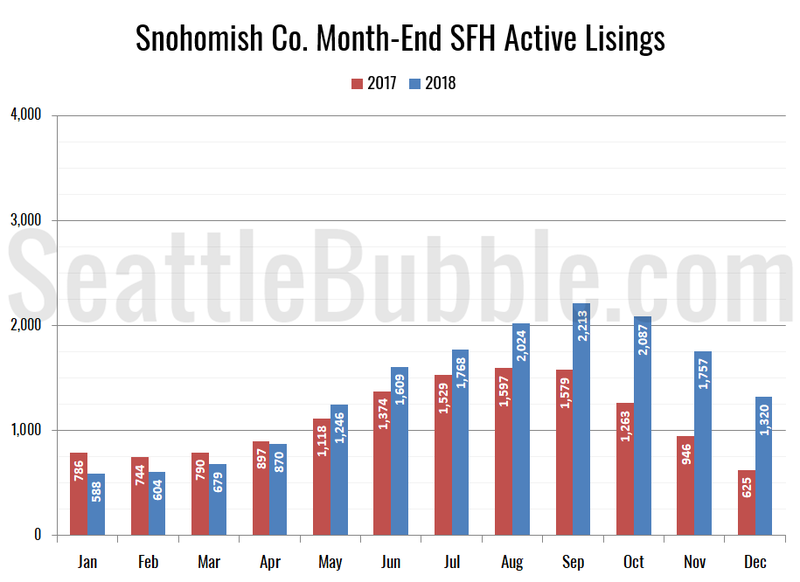 Dec ’18 active listings is 2,844. 4.5 x 2,844 = 12,000+! This is a very crude calculation but we may see 10k listings in coming months, especially if we hit a recession. This is bad news for sellers but buyers should sit out for now. I think a better more accurate prediction would be to assume the same absolute growth. Total listings grew from 1200 to 5200 at the peak, so add 4k to this year’s starting point amd we get 6800, which would put us in 2010 range, still a pretty big increase. I’m curious about historical condos too and how they might drive prices. Listings Limited By Lack of Pre-approved Loans at higher interest rates? Wait until the Baby Boomers start selling to go to nursing homes or moving to cheaper retirement states. Looks like everyone want to cash out the gain. Seattle housing has big headwind. If economy become another nose dive, Fed will have to QE and lower interest rate. Then another housing bubble cycle will be brewing again. If you work and live in Seattle and luckily own a house, you shouldn’t really care about housing price. Yep, potential buyers should just rent and relax. Many high-end areas listed below saw rents drop by 3% or more in the last quarter. According to MortgageNewsDaily, 30-yr fixed mortgage rates dropped from 5.05% on Nov 9, 2018 to 4.54% today. Today’s rates match those from mid Feb to mid Apr when home prices were rising. This is welcome news to housing bulls if the lower rates hold. But it is not going to avert the impending YOY price decline. What if banks are really smart and dropping rates now so when they raise them again you get last chance buying on lower rate. Buying and selling is as emotional as rational. Stair stepped rates increase sales verse steady increases. If rates continued to decrease and inventory increased nobody on the fense would buy because why purchase while cost is going down. With rising inventory and new tax laws it only makes financial sense to buy now if rate increases are going to freeze you out from getting the same house if you wait. Smart money, during rising inventory market, would drop rates during low volume season and then increase them upon high volume season to knock people off the fence who want to purchase but are waiting so they can purchase a better home at same or lower cost. What if? Let’s hope that will happen b cause If rates did continue to fall, with increasing inventory in spring, there is very little reason to not put off your home purchase in hopes you can get more house for less later. If you don’t knock them off the fence the housing market collapses. I posted this a little while ago on the other thread where I had first mentioned the previous drop. I just got a new notice of a drop to 4.25% with a 4.37% APR. That’s a full .75 drop on rate in a short period of time since they hit 5%. Jumbo loans I can usually get .25 to .50 lower than conforming rate. I’ll check that next week to see if Jumbo is 4% or a hair less. Jumbo and even High Balance Conforming is usually lower than conforming…which is the rate you most often see quoted. The days when you made sure you had a downpayment to bring you into conforming are long past. Higher loans get lower rates…through a Bank vs Broker. The article says rents are down $24/month in Seattle, and $50 on the Eastside. How long does it take to recover the costs of a move at those prices? And, wait a minute…. Isn’t apartment shopping now like buying just after the peak? Once one locks into a lease, they won’t be able to take advantage of the lower rents and better incentives that are coming. They’ll be losing all that money!!!!! Not that dirty apartment-mongers will care. It’s terrible to watch you trying to trap innocent tenants into undesirable leases. Oh, oh, the anguish. RE: Ardell DellaLoggia @ 11 – A .5% drop in 30-yr mortgage rates in less than 2 months is a huge deal. It does not happen in a normal economy. We have inversion up and down the yield curve. The last I checked 1 yr treasury is yielding higher than 7 yr! I simply don’t see how banks can survive (i.e. make money) if mortgage interest rates are close to short term rates. A trillion dollar company lost almost 40% of its value in 3 months. This is definitely a time to be cautious, especially when bulls are still around. RE: whatsmyname @ 12 – Your comment makes no sense. 1. There are many young/single renters who move yearly to score the best deals. 2. No landlord will rent under 6 months at prevailing rents, not even in a recession. The incentives (free rent/gift cards/amenities) are part of a lease. A renter does not have the luxury of time to wait for better deals. He/she needs a place to stay! But he/she can sign a 6-month/9-month/12-month lease and hunt for another deal when the lease expires. Eastsider, thanks for correcting ^^^^ that nonsense by whatshisname. On another note, did y’all see Tim’s excellent article on redfin about the disappearance of bidding wars? For Seattle City, on offers made with redfin, the prevalence of competing/multiple offers dropped from a high of 81% in Feb to a low of 10% in Nov.
Wow. Buyers are getting smarter. Not many offers being made. Just wait it out. By the way, if you REALLY feel that you should make an offer on anything right now, and there is another offer, just walk away. But better, just don’t make any offers in the first place. RE: Eastsider @ 14 – Didn’t understand the comment? It’s really very simple. Subject Seattle Times article said that rents in Seattle were down $24/month. That amounts to a whopping $288/year. On the Eastside, $600/year. Would you really come out ahead on the hassle and expense of moving to take advantage of that? Surely some people have. They are much too poor to even think about buying a house. I don’t imagine a 6 or 9 month lease would be available in a very nice place, but maybe you can correct me on that. Either way, the hassle and expense of two moves in a year really sounds unappealing. People happy using this strategy aren’t likely financially ready to do a successful purchase, and I would recommend against it. RE: whatsmyname @ 16 – Does Seattle Times’ $24/month discount includes free rent/gift card/amenities? What counts is the total cost of a lease and it has declined far more over the past year. Believe it or not, you can get a 9 month lease on a new apartment unit when the landlord is doing whatever it takes to fill the units. You still get all the move-in incentives. Yes, many young/single adults hop from one rental to another when their leases are up. They are not quite ready to commit to a permanent home yet but many are financially independent. Of course, people at your age are unlikely to move like the young adults. Rents Down? Interest Rates on 30 Year Loans Now Over 5%? The mornings are freezing, snow soon? What area is this happening in? I keep hearing this, but my rental condos have no problem renting. People are still on vacation for the holidays and the majority of schools are still out on break. Next week will be back to horrible traffic. RE: Erik @ 19 – They are new high-end apartment units centrally located in Seattle. Very different market and rents are much higher than your condo. You are free to shop around. December/January is generally a great time to get great lease deals. RE: whatsmyname @ 16 – Does Seattle Times’ $24/month discount includes free rent/gift card/amenities? Hard to say on inclusion of the amenties because, as Justmeh inadvertently points out, the submarkets with declines are those with the new properties – i.e. the ones that would offer incentives. Intuitively no, but the Times market map actually shows rent increases in the “non-prime” areas. What counts is the total cost of a lease and it has declined far more over the past year. Actually, the Times article says the YOY rents are still higher. But you are right that the total cost of lease is what counts. There are some who can benefit. If you are already paying $2500 or more; those incentives on new, prime , albeit small, apartment could possibly knock your effective rent down closer to $2,000. If you’re already paying 2,000, you could slightly upgrade for the same money, (of course that’s not really “saving money”.) And there is still the whole moving hassle/cost thing. This appears historically unusual, and evidence of an extremely competitive environment in new product. Are you seeing this in mid-range product? Are the incentives scaled down? You could maybe make a little scratch here. Maybe it is my age, but I can’t see where it would be enough to be worth the effort. Well, it all depends on how much rent you are demanding, does it not? You can always rent out a condo, it just a matter of having a competitive price. If you don’t have a competitive price, gimmicks like free months is how these big complexes do it. RE: whatsmyname @ 16 – A tenant doesn’t need to move to receive the benefits of rent reductions. When their current lease renews, they just renew at the lower rate. No moving required. RE: Justsomedude12 @ 24 – Again, I think the rent “reductions” are largely a market averaging effect tied to stabilizing properties. Unless your landlord is of the rapacious corporate variety, you are much more likely to experience holding over at current terms than signing a whole new lease at “market”. But let us know if you get to collect on your $288. ($600 on the Eastside). In fact, here’s a great data collection opportunity: Renters who have made a better deal, please write in to the Seattle Bubble. Did your LL offer you a better price to renew? Or if you moved: What location, size, quality, and price did you get, and what location, size, quality, and price were you replacing? RE: whatsmyname @ 25 – I think you’re trying to parse this a bit too finely in an attempt to find a reason that declining rents aren’t a good thing for renters. It’s really not a big deal for a landlord to reduce the rent in the new lease. Just takes changing one number. 30 seconds tops. I have friends who rent. They sign a new lease every year anyway. The landlord just changes the rent amount in the lease. Keep in mind that apartment buildings bank on the fact that once they hook you on a leasing good deal, that you will stay. They almost always increase your rent at renewal time with the reminder that you got in on a “special.” Then they gamble and hope the renter will decide that the inconvenience of moving outweighs the increase in rent. However, plenty of renters need to save money and lower expenses, especially now with the constant rental increases finally in the rear view mirror. They will have no problem shopping for a new rental deal and apartment complex annually and making the move repeatedly to chase the deals. I certainly did this years ago when I was single and I’m guessing many still do it today. Even a small $100 monthly increase is a lot on a budget. Friends with pick up trucks or SUV’s can move you for free on a weekend for some beers and pizza, which means very little moving expenses are actually involved. The smart renter shops around for deals when they are coming up for lease renewal, just as you should with just about anything else. Don’t be silly. Declining rents are definitely a good thing for renters. Do you know any renters with declining rents? Have them write in. RE: whatsmyname @ 28 – Actually, I do know a couple people who’s rent has decreased in their latest renewal. They weren’t large decreases though. 1. increasing rents means that renters will panic-buy houses. Awesome for REIC! 2. decreasing rents means nothing. Renters will stay. Awesome for REIC (yes, landlords are part of REIC)! See how this works? No matter what, house prices will be flat or up, and everything is awesome. Of course, the above doublethink is just self-serving propaganda. In reality, as we have seen, renters can and will go on a buyer strike and force prices down. RE: Justsomedude12 @ 29 – Alright. Let’s get some data started. What neighborhoods? Sizes? Price ranges? Quality? Did they have to push back to get the discount? You can be general enough to respect their privacy. Maybe you will prompt more people to bring more information. No one thinks that. Please find a more credible strawman. Although, here’s a weird bit of cognitive dissonance. By putting sellers and landlords in the same REIC category, you are implying that their interests are the same, and that renters have an alternative other than buying or renting? RE: whatsmyname @ 31 – One was in the Ballard area, and one was downtown. Not much pushing involved, just basically asking “what’s your best rate?” Not the newest 1-2 year old luxury buildings, but nice fairly new buildings. I manage an apartment in Fremont. Rents went up 10%ish from 2013-2016. They’ve held steady since, but it takes a lot more time to rent and the tenants are less desirable. Presently, I have a unit that would have been easy to rent in2016, but has been sitting vacant for over 6 weeks. It would likely rent if the price were dropped 5-10% but the management company has chosen to hold the price steady. Now there is a listing on Zillow with one of those units available for rent which says “This house has three different/separate living spaces”. It also says the owner is a licensed real-estate agent. I thought such use would not be permitted and that an agent would know this. Am I missing something? A couple of years ago I was thinking of buying a condo and following this blog. At the time a lot of people in the comments were saying there is no new housing construction and that the massive amount of apartment construction would have no effect, because it is a “different market.” At the time I pointed out that people like myself will just live wherever they can afford: an apartment, house, or condo, so it’s really the same market, and the massive flood of new apartment would eventually drive home prices down. Also, much of the single family homes are actually rented out, so if they go vacant they will eventually end up for sale. I just want to point out I kind of feel vindicated, since exactly what I said happened. I’m glad I didn’t buy that condo. RE: Brendan @ 37 – Yes. And now that apartments are overbuilt, many developers have switched to condo construction, so more condos are currently in the pipeline. As always, click on the link, then click once more for enlarged view. The graphs compare 2019-versus-2018,2017 inventory on an hourly basis. 2017 was the year inventory was at a multi-year low for most of the year. NOTE: At the time of this writing I am uncertain about the correctness and quality of the data collected since last week. Starting on 2018-12-28, the estately data behind these graphs has been a bit wonky, with listing counts staying the same for up to 24-48 hours, and then some big discontinuities that have not been present around earlier year-ends, AFAICT. This makes me a bit uncertain whether the data for the last week or so is correct. I’m waiting to see if the hourly numbers will start moving again, or this is a permanent problem. Stay tuned. Hopefully this is just a temporary problem. @Realistic, I figured out how to set the y-axis to start at 0 while at the same time having autoscale for the max value. The behavior of Amazon in comparison to Nazi Germany is unsettling. Both believe they have the right to remake the world in their vision, eliminating those who don’t play along. Instead of building a better future, they plunder and attack the existing economy like a cancer and set up shop in the existing infrastructure they helped to destroy. (Whole Foods and possibly Target) The people who participate in the largest economic genocide in human history will soon come to realize the middle class who made this country what it is are coming to get it back. Seattle is now made up of arrogant, self-centered new money douchebags who think 1 mil for a dilapidated rambler in Kingsgate is a good deal. With the tech economy collapsing, property taxes rising, and an income tax on the horizon, the good guys are finally winning and not a moment too soon. Time to pack your bags losers. LOL, Trump would veto it it, even if the bill happened. It won’t. The president has no veto power over QE. The fed does it all on their own. QT has disappeared $400 billion so far by the way. I’d love to hear Ardell or someone else qualified (I am guessing Tim shouldn’t talk about this) address the potential biases of Zillow/Redfin home value estimates and whether they are perhaps influenced by business objectives. Zestimate inflation has come up a few times recently in the threads. 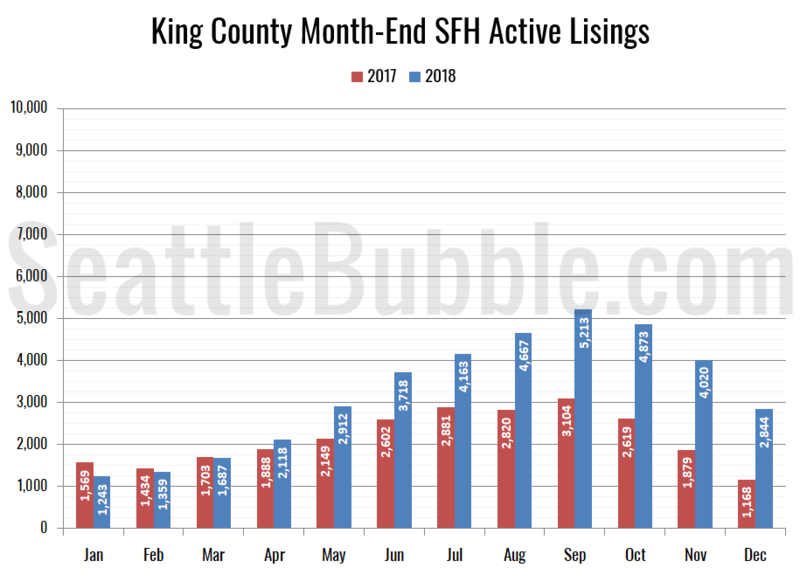 Specifically, some commenters have expressed confusion because their Seattle home values keep rising according to their home’s posted Zestimate or Redfin value while the monthly data shows Seattle and King county prices dropping over the past 8ish months. I too get a monthly email from Redfin telling me my home value has gone up X$. But I don’t believe it. The Redfin price history chart on my home keeps changing too. They keep revising what they allegedly said the value was in prior years. It seems like these tech companies have an incentive to dish out good news of ever increasing home values. If they kept sending monthly emails letting homeowners know their home value has dropped $X, they would probably lose users. No one wants monthly reminders of paper loses. The business incentive for Zillow and Redfin to report ever increasing home values to users seems to undermine their objectivity and reliability. That inflation might even have an impact on the real market. I’m just a user, I’d love to hear an expert speak to the relationship betweeen zestimates, business interests, and the real world. RE: Bumble @ 43 – When I was in the market a few years ago, I had a suspicion that Redfin inflated values of properties listed by them. I do think The Tim would speak on this and would be as much if not more than an expert on data/value algorithms as anyone. I look it is as a practitioner and see no big surprises. An algorithm, to be moderately accurate, has to stay narrow geographically. With sold volume down, and they are using sold prices plus other factors, the accuracy is highest when there are the most sales and lowest when there are fewer sales. Same can be said for an appraisal. I checked several houses with known, very recent, sold prices and don’t see any major issues. It depends how accurate you expect AVMs (Automated Valuation Methods) to be. I look at three, the internal mls AVM, Redfin and Zillow. Though I’m likely not looking at them for the same reason that you are. These should give you a ballpark and not be expected to be accurate. They are most off when all of the comps have 3 bedrooms on one level and your house has three bedrooms but one is down and two are up or two are down and one is up or some other issue that would make the data “the same” and yet different at the same time. All are 3 bedrooms and an AVM won’t care where those bedrooms are in the home. Are there business interests influencing Redfin and Zillow. Well Redfin is a Brokerage and Zillow is not, so their business interests are not identical in that regard. Redfin added a feature back at the end of September to adjust for some market changes called “Owner Estimate”. An owner can dispute the valuation there, but while I see the feature on all of the listings, I haven’t seen one where the owner completed the information. Maybe you want to try that and see what it does on your home. Take a screen shot of your valuations first. One thing I noticed some time ago is that the AVM can change dramatically as soon as a home is listed. So the AVM can be VERY wrong, but adjusted geared toward the asking price once listed and very quickly after being listed. Then that value reduces as days on market starts piling up. A house not for sale is depending entirely on the algorithm but a house for sale is usually adjusted. I think this to be able to claim how accurate their AVM is since by adjusting it by following the Listing Agent’s lead is going to cause it to be more accurate at time of sale, even if it was way off before it came on market. It is much easier for an algorithm to follow an upward trend in high volume than a downward trend in low volume. I looked at specific homes and noticed that one home that is not sold is using a price that matches the AVM tools but is on market a long time. The one that I know adjusts based on the asking price and days on market is running the lowest. But none of the prices match the comps. All are much higher than where I would say it should have been priced and even though the “heat” indicator says the market is COLD there, the AVM is showing the price at $100,000 more than the comps. Basically I think they are still all accurate as to “ballpark” but you still have to adjust for the real comps and features as they don’t seem to be adjusting as accurately for a down trend as they were during an uptrend. I don’t think that’s intentional or for a business reason. Just that it takes awhile for data to catch up with the market, given data usually is running in hindsight. Been out with money not buying for a few years now, got frustrated last year and started shopping for homes last fall. I started to drink the housing Kool-Aid toward the end, too (home prices are only going up in Seattle, Seattle is recession-proof, land is limited, must buy now as rates are going up, etc…). I very nearly bought a townhouse in Beacon Hill last fall right before the stock market started to tank. And I am SO happy I didn’t buy. with the amount of condo projects in the town and condo conversions, i think it may even be more than 30% towards the bottom in the belltown/capitol hill/slu area. Say for investment properties, is the rule of thumb 20% for down payment? what kind of income do you need to prove if you plan on making payments with rent income? I’m not a loan person or even employed in the real estate industry. I did buy an investment property before and the down payment was 25%. I’m not sure about what income is needed. My loan guy just said I could do it, so I did it. If you can buy owner occupied, live there for a year, then rent it out, that’s legit too I was told. Then you only pay 5% I believe. Lending changes and this was the information I was given a year and a half ago. I would guess nothing has changed, but call a lender. If we get a recession I think your prediction is the most likely outcome. If it is a tech depression it could be even worse, especially on the high end. Unfortunately, I doubt it will be the opportunity of a lifetime… that was 2012! I just wish I had been in a position to buy back then. @ Steven 46 – Generally banks look at your expected rental income (usually based on a rental property appraisal using comps) and give you credit for 75% as income – the other 25% is assumed to be vacancy, repairs etc. This always applies when buying a property already rented/occupied, on empty units you intend to rent I think it depends on the lender/time period you are buying in (ie after 2008 = no). Our LL (large public company) sent us a renewal offer that was an increase from our current rent, we responded with quotes from cheaper places nearby and asked for an offer that was more in line with the neighborhood. LL came back with another offer cheaper than our current rent and we accepted.